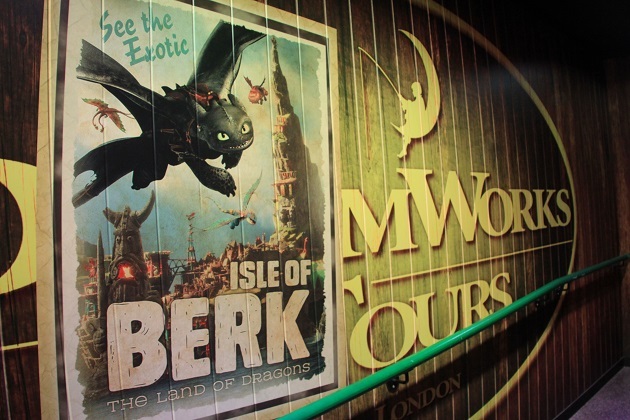 This attraction starring that famous ogre and his friends has been open in London for quite some time now. Son read about it then, remembered it now and when we organised this weekend trip to London he lobbied heavily to include it on our agenda. Our abode of choice on this expedition was the Premier Inn at County Hall. 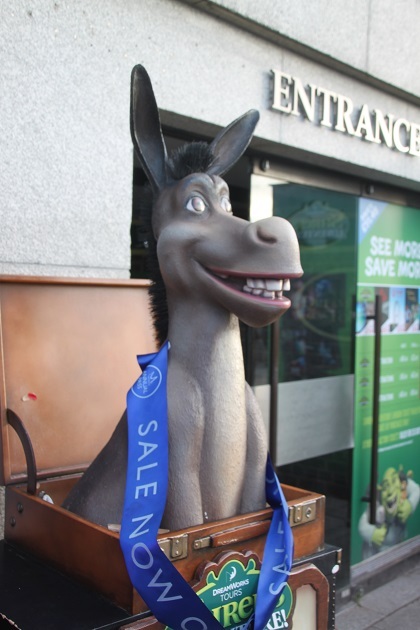 That worked for Shrek too – the attraction is in the same building and just around the corner so win win all round. 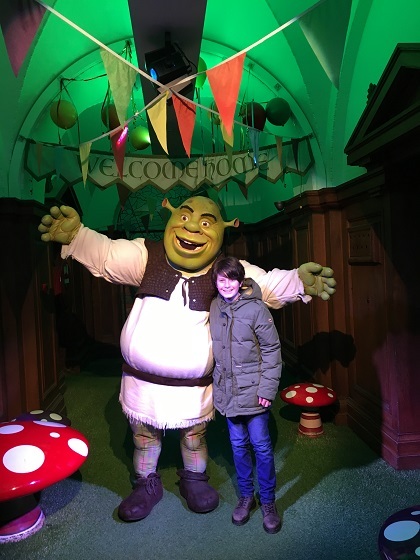 We left our luggage in the room, had a quick stroll and a bite to eat along the Southbank then it was time to meet Shrek and the gang. Booked slots are available throughout the day, I would absolutely recommend booking in advance to save (extra) queuing. On a wintery Saturday afternoon in January the place was seriously busy. Even with our advance tickets we still had to queue to actually get in, I was more than pleased we didn’t need to to line up to buy the tickets as well. They are a little cheaper on line too, we opted for a 3pm slot which for some reason seemed to be the cheapest that day – no idea why. We stood in line for about half an hour before our group of about 40 were allowed to proceed. That was a pain, I was getting grouchy with all that hanging around but eventually we were in. 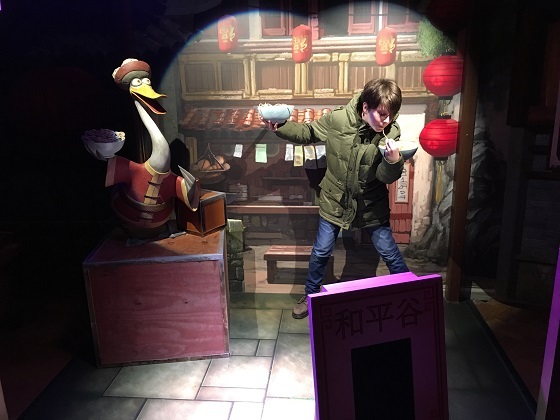 They call it an immersive storytelling experience but before everything kicks off they take photos in front of a giant green screen – no pictures allowed during the tour unfortunately. We were led through a “forest” and met a whole series of fairytale characters. Cinderella first, a fortune teller next – each meeting involves the audience joining in, this is not for shrinking violets. Son and I were beside ourselves when the fortune teller took Husband up to the front claiming he was a “trained dancer.” She must have been able to sniff his horror, needless to say we loved that and watching him squirm and then dance. We passed through a whole series of entertaining scenes like that. Wheel of Torture with Pinocchio was entertaining, a pub run by Cinderella’s Ugly Sister and then a cell with a witch were our highlights. We loved it all but some small children were completely freaked out. It is dark, quite spooky and a bit grim in parts. 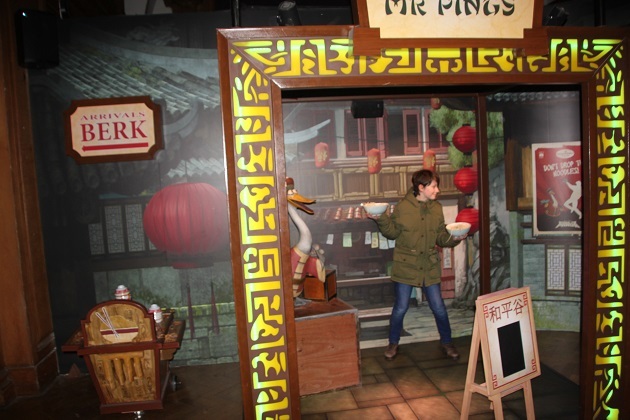 The humour was excellent, aimed at both adults and children and we thoroughly enjoyed the whole experience. Great actors, plenty of atmosphere, good effects and fantastic theming, it felt like we were taking part in our own pantomime. At the end we passed through a mirror maze and escaped to safety. Shrek was waiting and in this area you were allowed to take your own pictures. Lots of other scenes from Madagascar, Kung Fu Panda and How To Train Your Dragon made for some good photo opportunities. They showed us those first green screen photos in a quirky Shrek album. We usually avoid that stuff but thought this was different and unusual and ended up buying it. We managed to avoid any further purchases in the gift shop before heading outside. The whole experience took about 75 minutes and was just great. I was pleasantly surprised having read mixed reviews. Lots of people loved the bus ride and weren’t so impressed after that. The ride was fun but for me the scenes with the actors and different characters were the highlight – different, engaging and an all round fun experience. 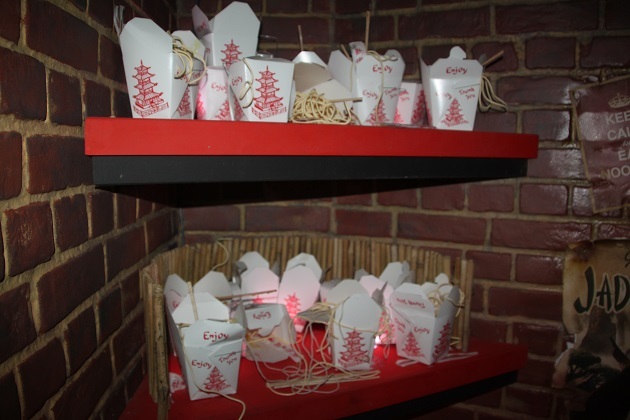 What a fun activity for you to enjoy on a bleak winter’s day in London. Thank you for your vivid description of Shrek’s Adventure. I wasn’t too sure what to expect but we all loved it. Like you say, on a grey and dismal January day this was just perfect. We have lots of nice sunshine today though – fingers crossed it lasts through the weekend! If the kids liked it, that makes it even more fun for the adults. Absolutely and that’s exactly what happened here! That sounds like a fun experience, a bit of a twist on a winter pantomime. I am glad it was worth lining up for. It was very different to anything we’d done before. I wasn’t sure what to expect but we all had a fun afternoon. Very cool, Joy. How long has this been open? Any problems with people who gave motion sickness? Is it like Soaring in Epcot? I think it’s been open a couple of years now George but it still is really popular. My husband gets motion sickness but was absolutely fine with this ride. It was fun but not a patch on Soaring!! Me too – I love Donkey as well! Those kind of places you either love or hate, but it all what you make of it and how much you can let go and just enjoy, like you did. Looks like a fun place to me. It was so much fun Terry, we laughed so much and had the best afternoon. You can not ask for a better afternoon. I’ve often passed this attraction and wondered what it’s about! You’re son’s pretty good at posing for the camera. He gets lots of practise!! We’ve gone to London for a weekend in January the last couple of years Rosemary and it feels like such a treat after Christmas, this time was no different. I have to say I probably prefer Frozen to Shrek so I’m with your granddaughters on that!! Whoever thought up the concept is onto a winner Joy – didn’t know it was possible to have so many Frozen accessories! Today the elder one was wearing her Elsa dress – she dresses herself now so we are used to being seen round town with her in her “Queen” outfit! That looks great, hadn’t heard about it. 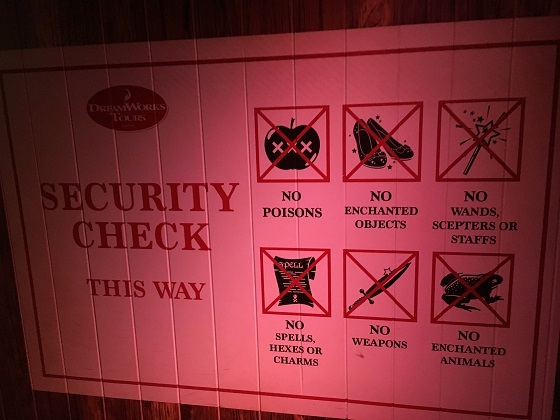 Love the security check too! It’s so much fun – I think kids enjoy it more when they’re just a bit older though, some tears and freak outs from the very little ones! Is it part of an amusement park? Or is it a free-standing Shrek adventure in the middle of town? No it’s just a Shrek attraction on its own, not part of any park. Sounds like a fun day out! Too bad the little ones got scared though! I guess people aren’t sure what to expect and it depends on the little one – what freaks some out is fine for others. We loved it though, no freak outs in our group! That sounds like a good place for us too if we get to London. 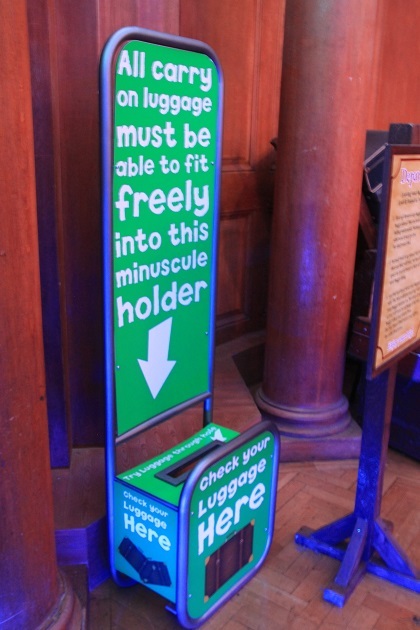 The tip to avoid even more queueing is valuable, that’s the always the toughest part with kids! Hanging around to get into these places just puts everyone in a bad mood before you even begin!! If you do visit definitely buy those tickets in advance. 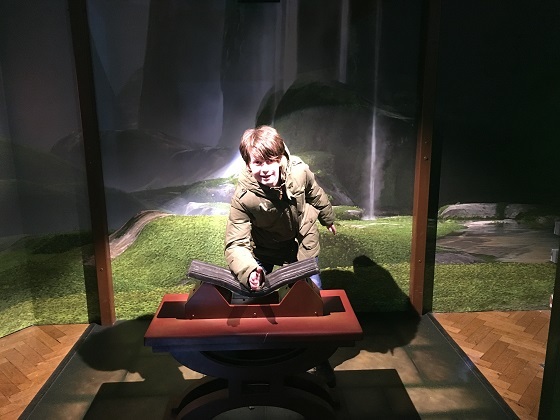 Joy, what a fun adventure for your Son…London is always a good idea for me! For me too Pam!! We just love London. 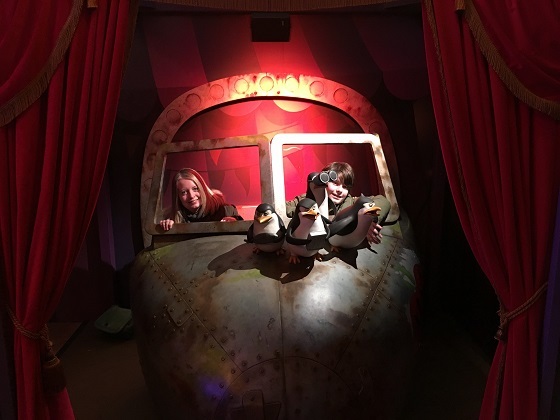 I definitely recommend it if you’re in London – it’s something very different and so much fun, we all enjoyed it such a lot! Really want to see this one too! It’s so much fun, we loved it and would definitely recommend!